Rathbun Lake Trail – French-Reneker-Associates, Inc.
A trail connecting Honey Creek Destination Park to Prairie Ridge Park was constructed on the north side of Rathbun Lake. This trail was constructed after years of effort from Appanoose County Trails, Inc., a non-profit trails organization, to get a trail around the lake. 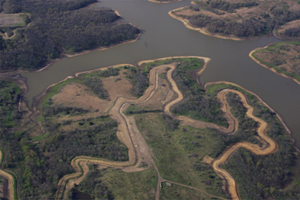 The site is owned by the U.S. Army Corps of Engineers as part of Rathbun Lake. French-Reneker-Associates completed the design of the trail in three months although there were many challenges along the way. The 8.3-mile-long, multi-use trail goes through solid brush. French-Reneker-Associates had to change the route of the trail several times to avoid artifacts, endangered species, and wetlands. Not all the wetlands could be avoided, so French-Reneker-Associates developed wetland mitigation areas in conjunction with the trail design. The estimated $1.5 million project was funded by Department of Transportation American Recovery and Reinvestment Act (ARRA) funds.